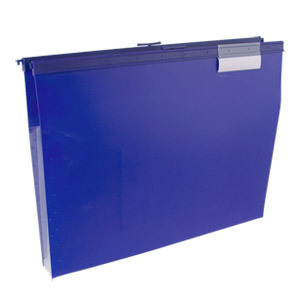 Keep your important files safe with this Wilson Jones Slide-Bar File Jacket with CD Holder. This file jacket is the perfect practical file holder because it easily converts from a hanging file folder to a folder you can take on the go. Simply retract the hooks and invert the tab! No more snagging or tearing when you take a file on the go. This expanding file folder, which expands up to 5.25 inches, is made from durable polypropylene and offers water-resistance to protect important documents. Plus, it includes a built-in CD pocket so you can keep important electronic files safe too.